Hello my lovelies! I’m so excited to share with you the Belcarra Blouse by Sewaholic! Back in February I got an email to ask if I wanted to test the pattern and after doing a little shimmy of joy I sent back a very happy ‘yes please!’ to Tasia. You’ve seen the Belcarra Blouse quite a bit on the Sewaholic Blog already as Tasia was wearing it to model the Gabriola maxi skirt. It is such a quick make but has some lovely details that really set it apart from your usual knit T’s. View A is a simple raglan sleeved top with bias cuffs, View B has the cute pleat / tuck details and View C has the little pocket. Me being me just had to overload my tester version with all the details so I made View B with the addition of the pocket from View C.
There are no darts in this top so it’s quite a loose fit but to accommodate the bewbs I did need to do an FBA (Full Bust Adjustment). I used the ‘Fit for Real People‘ Method which adds a side dart. I did consider rotating the dart out but this added more fabric to the front and that’s not a look I’m a fan of. 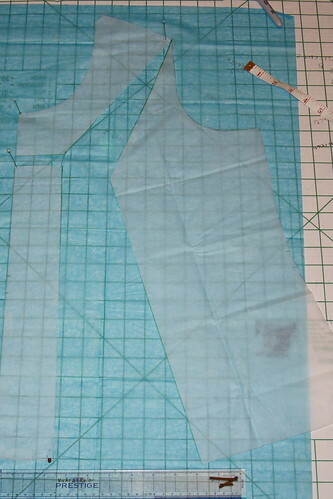 However, Stitches and Seams has an FBA method that gets rid of the side dart and that extra fabric. I’m going to give this a go on my next version. Whilst I love the fabric I made this top from (a japanese slubbed cotton) it is probably a little too stiff for this stort of top – something much more liquid and flowing would give softer lines and would not crease nearly as much as mine does! 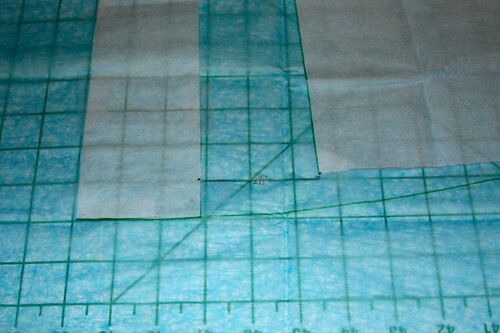 As a result of my fabric choice, my version looks far better tucked in than it does left out. I wear it a lot to work with this Rachel Comey for Vogue 1247 skirt that I made over a year ago which is another wardrobe staple. In the defence of my fabric choice, because of the slubs in the weave it makes it really easy to find the grain line and also makes the bias areas (cuffs and neck binding) a bit more interesting than just a change in direction of the print. You could have a lot of fun with stripe placement on this top! This is a really satisfying and fast make. It has the potential to be a wardrobe staple depending on your fabric choice and it wouldn’t surprise me to see people with multiples of these in their wardrobes. I have a number of future versions planned including one with lace sleeves (omitting the pleats and cuff) as I think that will look really cute with a solid coloured bodice. 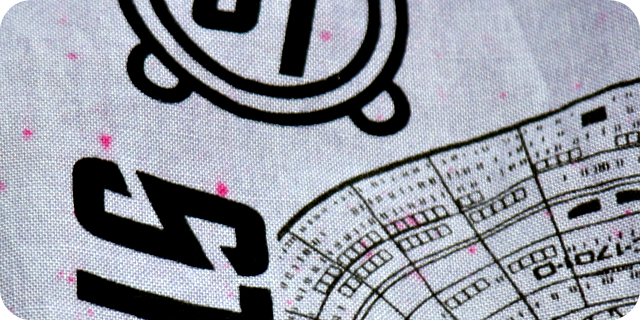 I have a couple of other drapy fabrics in the collection that are destined for this top now too, particularly as it’s not too fabric hungry – mine came out of less than 2 yards of 44″ fabric. Who knew that something as simple as a T could be made so interesting?! Thank you for the experience of pattern testing for you Tasia, I loved every second of it. I thought I’d break up the By Hand London love in that’s going on around here with a return to our favourite Canadian designer! This is my second version of the Cambie and this time I chose to use the A-line skirt as gathers on my waist aren’t my favourite thing! I made this dress for a party with a BBC theme – which is about as broad a remit as you can get! I decided to go with Star Trek as I used to spend every Tuesday evening sat on the floor in the lounge, eating dinner with my Dad watching The Next Generation on BBC2. Captain Jean-Luc Piccard was and is one of my heroes! And when I saw the above it was just perfection. But back to the dress! As I mentioned, it’s Sewaholic’s Cambie with the A-Line skirt. 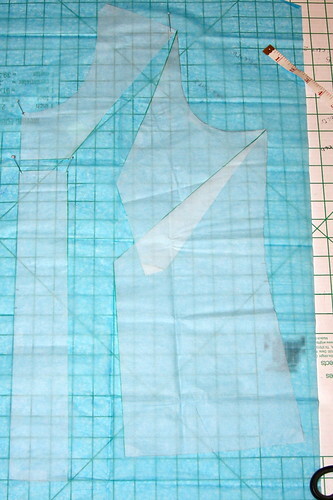 Bodice wise it is identical to the first version; usual FBA and sway back adjustments. The skirt is as Tasia drafted. It all went together beautifully. 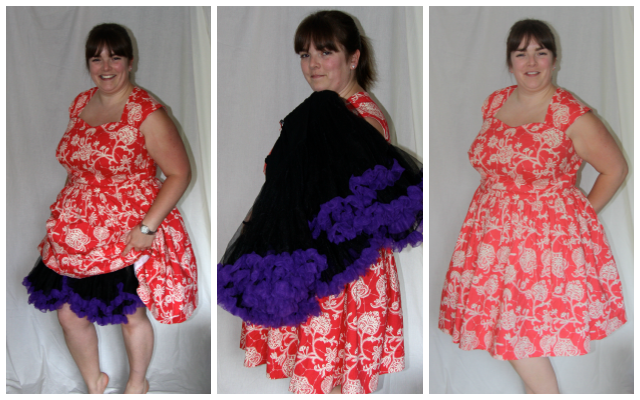 I had a lot of fun turning the plain Enterprise printed fabric (from Plush Addict) into the gorgeous Ombre you see! I did a bit of Google research (seriously, doesn’t all research start there?!) and used this tutorial to dye the dress. Because I wanted the Ombre fading down the dress I made the dress shell first and then dyed it in a mix of Navy and Amethyst Dylon dye with the shoulders staying in the longest. That was fun and messy! 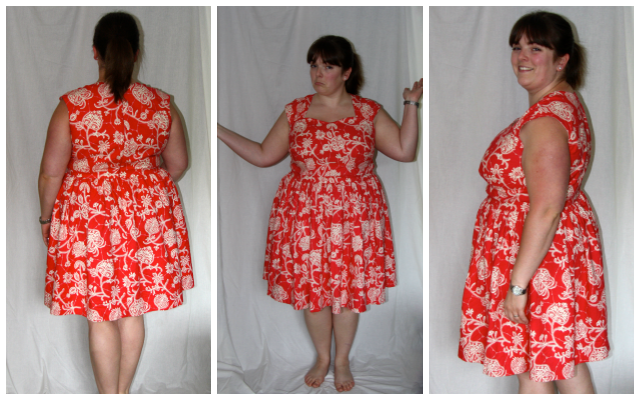 But as I made this dress back in June (I did warn you I was way behind on blogging my makes!) I played with the dye outside. It’s not a perfect job, there are some bright pink spots where I didn’t quite mix the powder properly into the water before dunking the dress, but I kinda like the odd bright pink spots dotted across it. 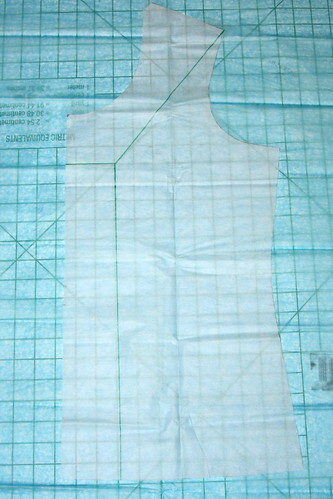 I then finished the construction with the bodice lining etc as per Tasia’s instructions. 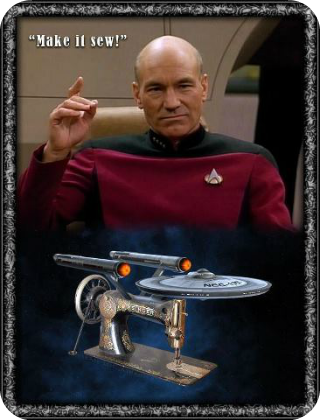 Just to finish off the outfit, I bought a communicator style brooch from eBay and wore that on the dress as well (Not a TNG one though too much ££! It’s the style in the recent films which I loved!). I got so many comments on the dress and I can also wear it as day wear. In fact I’m wearing it today, along with my Victoria Blazer whose lining coordinates beautifully with those bright pink spots! I love wearing dresses and cute tops and skirts that I’ve made. I also love coming home at the end of the day and putting on something that I can lounge around in comfortably. Enter the Tofino pattern by Sewaholic! I’d intended to make these at the time Karen ran her Tofino PJ party but didn’t have time to make PJs in the run up to my sister’s wedding. So these were made a while ago but definitely after the pyjama party. I absolutely adore the fabric and have to say a massive thank you to Kate at M is for Make in helping me select the right coloured solid turquoise blue to go with the Supernova fabric. I made the piping in navy and I don’t find it uncomfortable to sleep on. In fact these have been keeping me company in Preston whilst I’m on a course for work. It’s nice to end the day lounging on the bed wearing these and a vest top whilst catching up with what you’re all up to and watching a bit of telly. I did alter the pattern a little in that I took some of the width off the leg pattern and added it to the side panel to get a better balance between the two. I also lopped an insane amount off the leg length (a not uncommon adjustment with these!) and they still drag on the floor a little when I walk, but I like to be able to tuck my feet into them when on the sofa. Helps to keep my toes warm as I’m not a great fan of slippers; I’d much rather be in bare feet. Other than that they’re made as per the instructions and were a very fast and satisfying make. Not a lot more to say really other than these are incredibly comfy and just a little bit more glam than the rest of my PJ collection! I’m looking forward to making some more in a soft flannel for the cooler weather. 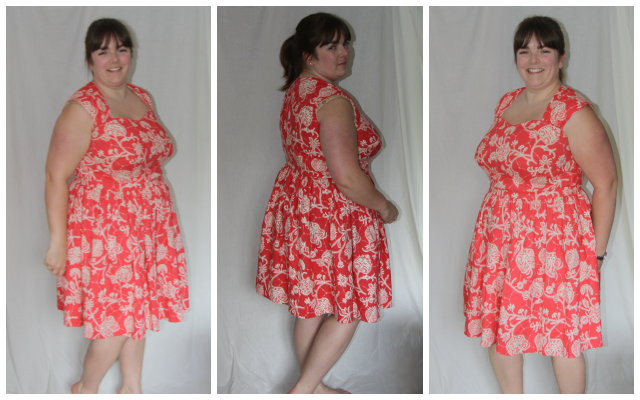 Nearly two months after finishing this dress, I’m finally posting about it! I made this dress for our friends’ wedding on the 22nd March; the colour theme was purple and orange and I wanted to pick that up in what I wore on the day. The fabric is Amy Butler ‘Souvenir’ from the Lark collection. I’m not really sure what colour it is; in some light it’s orange, others a hot pink, and sometimes a deep coral. Some have even told me it’s red! I love the richness and warmth of the colour, whatever it is. There’s not a lot to say about the Cambie pattern or the construction really. 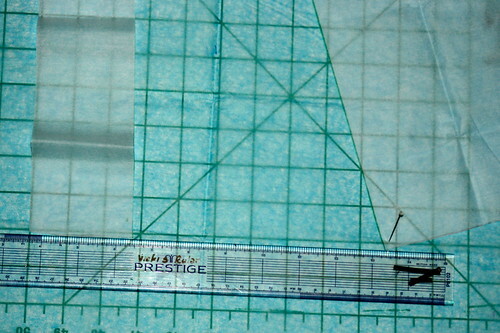 As always with Tasia’s patterns the drafting is faultless and the instructions good. I had no problems making this dress at all. I’m particularly pleased with how neatly the zip went in; there was bragging on Instagram and Twitter when I’d completed that step I have to admit. I didn’t make any changes to the pattern other than my usual FBA and using the full width of the fabric for the skirt panels, which definitely made for a fuller skirt! I love that putting a petticoat on with this dress gives it some added impact, but that it’s also great to wear without the extra oomph as a day dress (which is how I wore it for my sister’s hen do in Cambridge). PS: There’s still a few hours to enter my give away here! This was made and completed in January. 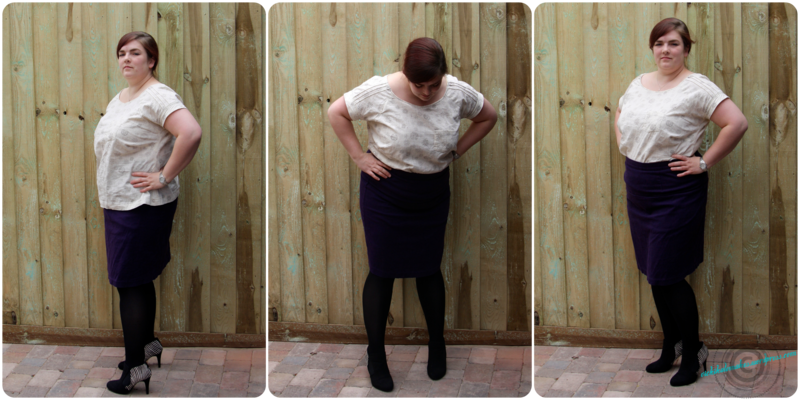 I’m just useless at taking photos and blogging with any sort of reliability! 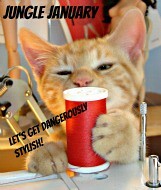 It was made for Jungle January and made in time; just the photos and blogging let it down… Ooops! God I’m a moody stand-offish cow in photos! 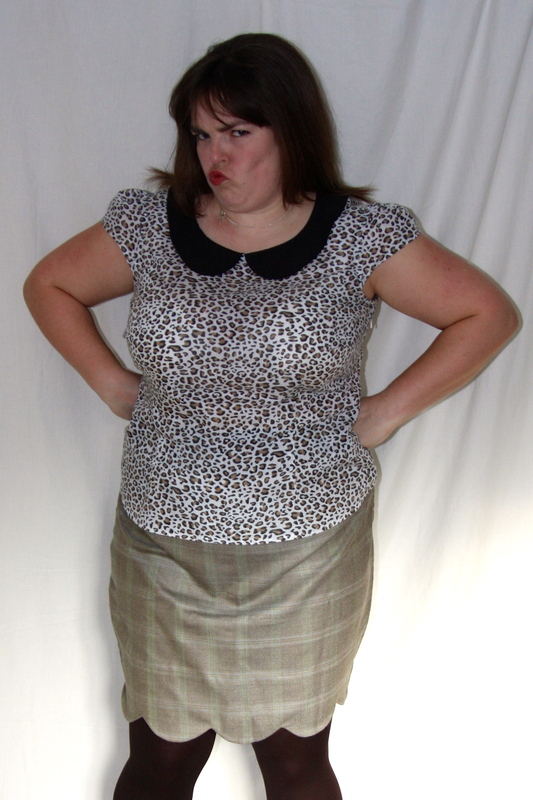 I’ve fulfilled some ambitions with this top though; peter pan collar, animal print and a fitted blouse! I love the side zip as the blouse has shape but I don’t have to worry about the unfortunate combination of a full bust, buttons and gaping. 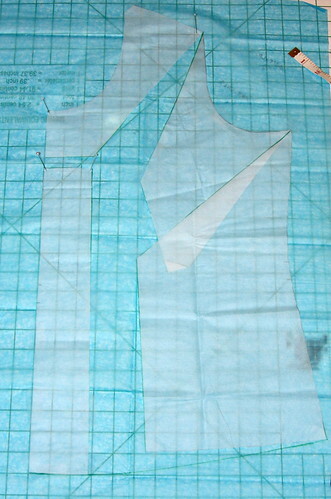 I have another version of this already planned in a Japanese slubbed cotton. It’s a fast make too and I’m not a particularly quick sewasaurus. The only change I made other than my usual fitting ones was to use bias tape instead of the neck facing. I used the Colette Sorbetto method of attaching it and did the same at the armholes rather than using the piece Tasia had carefully drafted (Sorry Tasia!). I did find making the collar meet nicely in the middle a bit of a pain, and also sewing the curves on the collar so that it looked as symmetrical as I could get it was a test of patience. I’m glad I took some time to get it right though as I think the collar looks pretty good and not at all home-eccy! 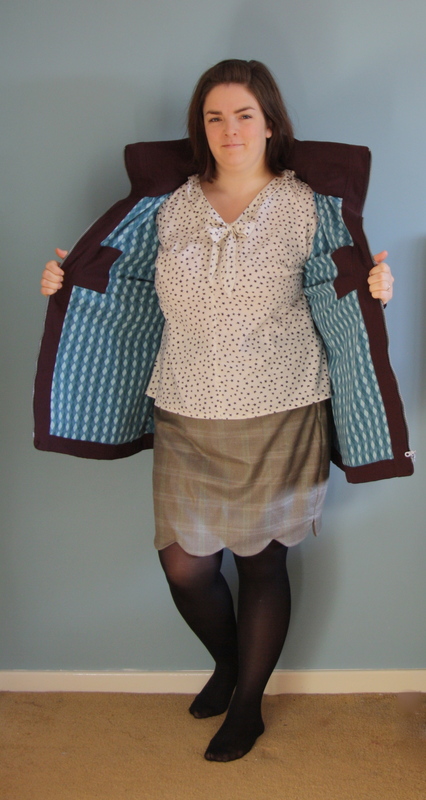 This is my biggest project since I started sewing my own clothes: The Minoru Jacket by Sewaholic Patterns. I love this jacket! I didn’t add piping as I’d planned because *looks rather sheepish* I forgot (just in case any of you were wondering where it was). 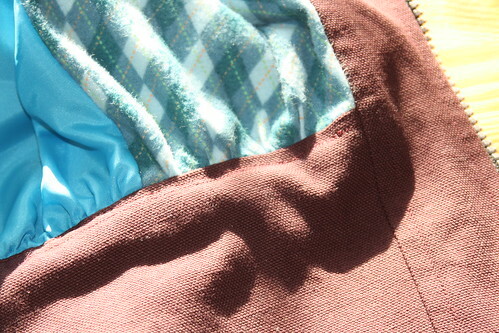 This is a substantial jacket as I made it from cotton canvas that I proofed with NikWax. It has some heft to it, but isn’t too heavy to wear. It’s lighter than a waxed jacket but heavier than my normal winter jacket (a ski coat). Like others, its garnered compliments from complete strangers, which is rather flattering! Checking the fit during the muslin stage means that I can wear it whilst driving the car and its also passed the dog walk with a toddler test. An unexpected bonus is that pre-treating the canvas means that once mud has dried, it just brushes off. I haven’t tested it in the rain yet – it was full on waterproofs downpours early part of last week and whilst I think this would be fine in a shower I didn’t feel up to testing in that sort of weather! 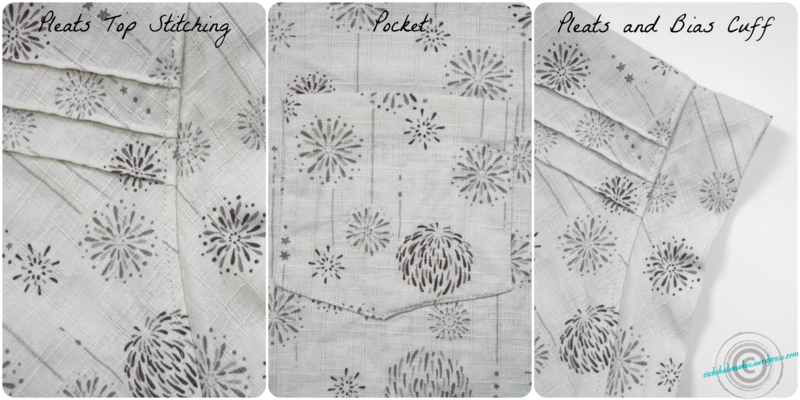 The sleeves are lined with regular lining fabric so that long sleeves are a breeze when I’m wearing it. The body is lined in cotton flannel which is sooo soft. 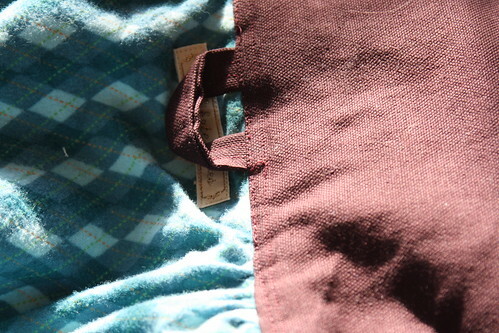 The side seam pockets and hood are also lined with flannel too and are lovely and cosy. Boy likes to hide his hands in the hood and stroke the fabric if I’m carrying him. Can you see the wonky stitching? When I make my summer version I will make a couple of changes in the construction though. If I include a hood I’ll finish the seam allowances when I attach the collar to the lining and bodice before attaching the two together. You can see the unfinished edges when you peek inside the hood pocket. 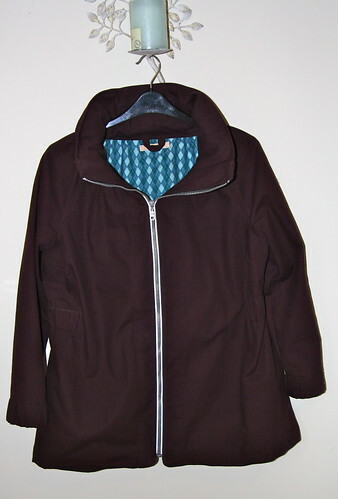 Or I may fold them into the body of the jacket instead, but that may feel a bit odd around the shoulders. 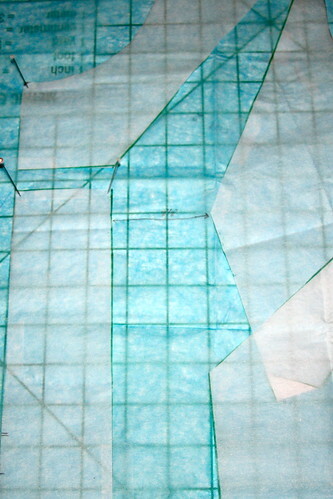 I’ll also be sure to finish every seam before topstitching for my own satisfaction more than anything else! I will also buy three reels of thread. I bought two for this version and only used a regular stitch for the topstitching and there was literally just a foot left on the spool at the end and the bobbin had just run out. I’m really pleased with the fit although I need to reduce some of the ease in the waist as I’ve lost weight since fitting this and its now got too much ease there – I’ll have to futz with the elastic channel to cinch it in a bit, but it’s a good reason to have to futz really! Add welt pockets instead of in-seam ones?